Vancouver has lots of shops, restaurants and bars, as in every big city. Both small groceries and giant shopping malls. A few decades ago wealthy Asians from Hong Kong started to buy Vancouver apartments in excessive amounts. Their investment contributed to a real estate boom. Hordes of Asian immigrants followed by the intense adjustment of the local infrastructure in recent years have led to a state that can only be defined in one way. The whole city is dominated by Asians. This has given the local retail market its certain profile. In a typical food court you would find a dozen different fast-food restaurants offering a range variety of Asian cuisines. On the top of that many Asian establishments are indistinguishably blended into the streets. Moreover, there are even real Asian shopping malls! One would need months try out all the foodstuffs severed here. Before the visit to Vancouver, I was of the opinion that Asian cuisine is can be simply divided into Chinese, Japanese, Thai and Indian food. If you eat sushi it is not anymore a mere piece of fish with wasabi and terryiaki sauce. There are dozens different sushi styles available. I suppose that all the varieties of Asian cuisine can be written in eight thick books and it would only be one third of the potential menu. We will find restaurants serving Vietnamese, Korean, Myanmar, North- and South Indian, and even the Laotian national dishes. Kimchi is one of the more interesting foods I found. This is a Korean dish consisting of fermented vegetables, mainly cabbage, sauerkraut and chili peppers. Very spicy! A friend from Seoul says that kimchi was originally stored in cool places, for example, buried in the ground. Nowadays, every Korean family has two refrigerators in the house, the usual one and the other meant to store kimchi. Bubble tea is a Taiwanese origin yogurt made to order (with a chosen flavor). It has small starchy beads of Tapioca derived from cassava root (the seeds taste similar to soft peas). Yogurt with beads at the bottom of the drink is consumed using a special extra-wide straws. 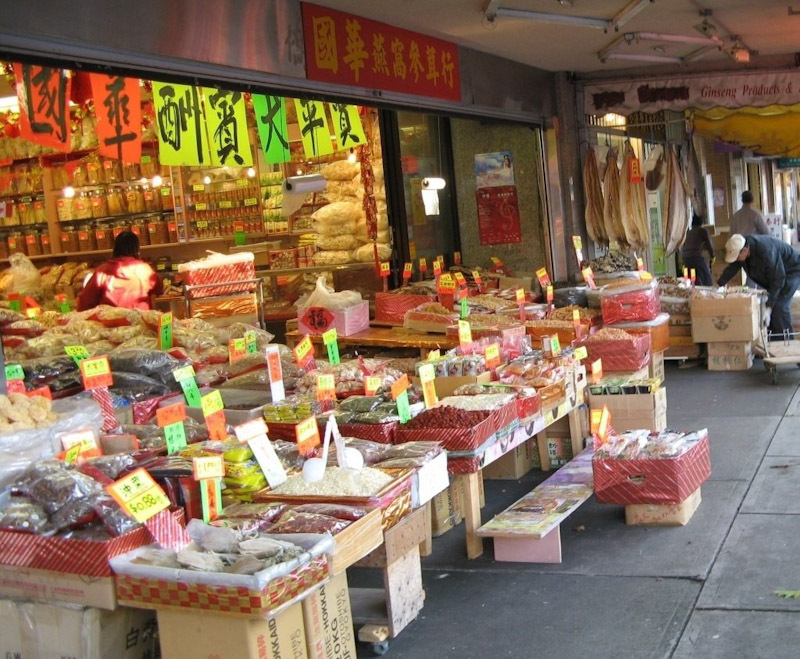 The real bizarre food can be found on Chinatown markets. Various rhizomes, herbs, spices, dried fish, prickly seafood, fruit of unknown origin and very hot spices. All with a bit of mystery, you never know what would happen if you consume it. Canada is benefiting a lot from culinary revolution brought by newcomers from Asia. There is reason to fear that had it not been for the Asians, a typical Canadian would be only able to dine at an English style tea with deep-fried fish & chips. What a relief!